Gaining in popularity, hard ciders are not just for the fall and winter. Good hard ciders have a tart, refreshing flavor that make them ideal for spring and summer cocktails. Ciders from Crispin and perries from Fox Barrel are amongst my favorite brands, but I live in New York, where there are 51,100 acres of apple orchards. There’s got to be some local, high-quality ciders. I wasn’t completely surprised to learn that two of the best ciders I’ve tasted, True Believer and True Companion, come from Long Island. But curiously, these two ciders are produced by an excellent Long Island winery, Peconic Bay. I’ve had nothing but good experiences with Peconic Bay and their wines. When the retail store that they’re affiliated with, Empire State Cellars (ESC) out in Riverhead, New York, sent out notices that a new batch of True Believer was coming in and there would be a tasting, I said to Mrs. Ferment, also a fan of ciders, that we had to attend. Just a quick aside: I cannot speak highly enough about the helpful folks of ESC and the store itself. If it’s alcoholic and produced in New York, they’ll have it—wines, beers, liquors, and ciders, of course. Their selection is fantastic, and it’s a great place to find local products. The staff is knowledgable and helpful. They have weekend tastings, often free, and they have samples of some of the more unique offerings like whiskey from Brooklyn and brandy from upstate distillers. When Mrs. Ferment and I attended the cider tasting in March, ESC’s manager, Evan, was our host/bartender, and he went out of his way to make sure everyone got to taste everything offered, including a half-a-dozen cocktails made with True Believer. The wife and I were greatly impressed by these cocktails, and it opened up an ingredient that I hadn’t used before. 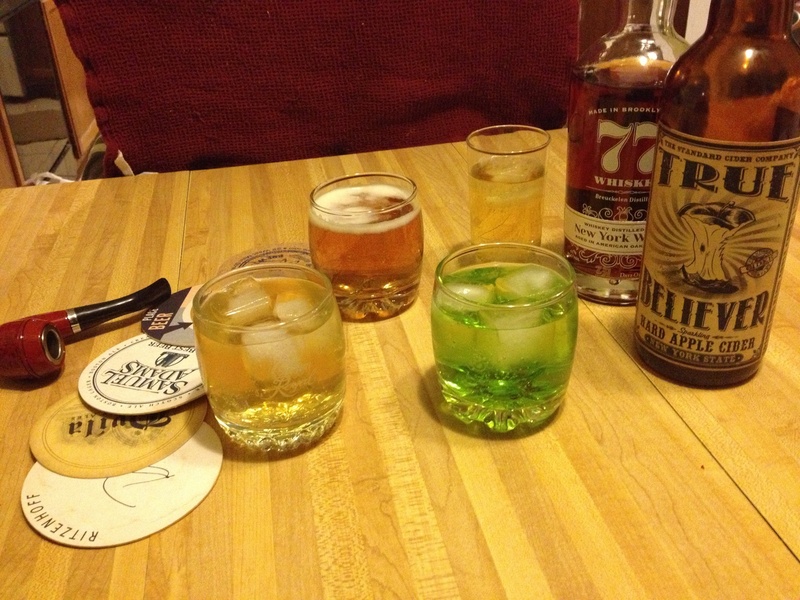 True Believer, Breuckelen 77 whiskey, beer, and Midori are all ingredients used to make some delicious cider cocktails. Evan gave me a copy of the cocktail recipes he made that night, and we made some at DnU HQ for Melba and other friends to try. The brightly colored Green apple cider was a hit, and was favorably compared to sour apple Jolly Ranchers. Despite not liking sour apple Jolly Ranchers, I thought it tasted good too. If using ice, fill collins glass with ice. Pour chilled cider into glass; top with Midori. Adapted from Organic Authority. A surprisingly tasty cocktail was one of the simplest. The Prairie fire combines the cider with hot sauce. It sounded weird, but tasted great. The hot sauce didn’t make the drink spicy so much as it added a complementary, mildly smoky flavor to the cider. Pour chilled cider into glass. Float hot sauce over cider by letting it drip slowly over the back of a spoon. Adapted from Organic Authority. True Believer, all by itself, is a satisfyingly tasty cider. It’s dry. The crisp, clean tartness of the apple is its main draw, but there’s an underlying sweetness that lingers, and it’s not at all acidic in its body. It’s clear, straw-colored, and effervescent, and very refreshing. We purchased a couple of the 750mL bottles the night of the tasting—I guess free tastings works out economically for ESC—and both were gone within a week. The more mellow and molasses-hinted True Companion was offered at the same event, but from an previous batch. A couple of months later, True Companion’s 2013 batch came out with a new addition, ginger. I enjoyed the previous version of True Companion, but the addition of ginger kicked the cider to a new level. The molasses undertones are a bit harder to taste, but the ginger, not overpowering, gives the cider a suggestion of apple pie or spiced apples. At the March event, we didn’t use True Companion as a cocktail ingredient, but the latest batch really works with the bourbon and ginger ale recipe that Evan gave to me. Ithaca Soda Co. Ginger Beer (non-alcoholic), True Companion, and bourbon make a great summer cocktail. Put ice in collins glass, pour ginger ale and bourbon into glass, top with cider. Add a swizzle stick and apple slice for extra fanciness. Adapted from Creative Culinary. I favor True Believer just slightly more than True Companion, but True Companion does get nostalgia-points for having the same name as a Donald Fagen song from the movie soundtrack of Heavy Metal. Both hard ciders are delicious and refreshing, and there’s no reason to save them for cooler days when they’ll quench thirsts during the dog days. FYI The apples come from Seneca Lake and is produced by Brotherhood Winery. They are great ciders. Thank you for the heads up! I will see if I can find Steampunk on Long Island. How would you describe this cider?